1. Main Titles/Orchestral Prelude. This is really short and I’m not familiar with the music, but it sounds energetic and upbeat. 2. Tina Arena sings Whistle Down the Wind from Whistle…. A pretty good song, and she has a lovely voice. 3. They go into stuff from Joseph, which I love, and they bring out a children’s choir and Donny Osmond. Osmond has toured nationally singing the part of Joseph and it shows. They begin with a combination of the Fanfare from the beginning of the show and go into Any Dream Will Do. I love this; Osmond and the kids are fantastic. 4. The kids stay with Osmond onstage while he sings Close Every Door. Wow. 5. Julian Lloyd Webber takes the stage with his cello to play Variations I-IV and Variations XXII-XXIII. These pieces are for cello and rock ensemble; they come from the second half of Song and Dance. I love the first piece so much that it makes me want to play the cello, and it is fun to watch Julian Lloyd Webber play. For the second set of Variations, dancers are added, but unfortunately you don’t get to see much of them. The camera mostly sticks with Julian Lloyd Webber and… it’s getting a little boring to watch just that. It’s too bad that there isn’t a special feature on the DVD in which you could change angles and see the dancers better. 6. Moving on to Evita, the funeral music theme is played and appropriately dressed “mourners” assemble. I suppose I shouldn’t be thinking this, but wow, 40s style clothing was beautiful. Why do we keep emulating the 70s?! 7. Antonio Banderas sings Oh What a Circus from Evita. I thought he was great as Che in the film version of the musical and he shows that he can sing, dance and act all in this one song. He even tangos briefly with a chorus girl! I’m impressed. 8. More Banderas, only this time he sings High Flying, Adored. I’ve always loved this song and Banderas sings it well. I was disappointed that they made this into a solo, though; in the musical Eva sings a verse at the end. They could easily have added that in since the next song of the evening is an Eva piece from Evita. 9. Actually, this is probably the Eva piece from Evita, everyone knows it. Elaine Paige comes out to sing Don’t Cry for Me, Argentina. And she’s really good. But it’s still always going to be my least favorite song from that show. 10. Onto Starlight Express, but only for one song, which is fine. Starlight Express was not Lloyd Webber’s best idea, although I’m sure the idea of a musical about trains done entirely by actors on roller skates seemed creative… Yeah. But Light at the End of the Tunnel is upbeat and fun, and it is, indeed, performed on roller skates; Ray Shell is the soloist. 11. The next segment mixes work from Jesus Christ Superstar with Andrew Lloyd Webber’s Requiem, which is… strange. Thematically I guess it makes some kind of sense, but Jesus Christ Superstar is a rock opera and the Requiem is more of a classical style piece. At any rate, this section begins with Hosanna from Jesus Christ Superstar. Watch out, this is a great song and it can really get stuck in your head. I love the lyrics “Hey J.C., J.C., won’t you die for me…?”… it’s just not how you usually think of the story of the Passion. 12. Moving into the music from the Requiem, Dennis O’Neill belts out the Hosanna. It’s a lot more upbeat than most segments from a Requiem mass, but it’s impressive. A choir/chorus – including the children who participated in the Joseph segment – backs him up. There are dancers performing good liturgical dance. 13. Sarah Brightman and Ben De’Ath sing the Pie Jesu from the Requiem. Wow. This piece always gives me chills, and this is no exception. The choir joins in on the “Agnus Dei” segment. 14. Back to music from Jesus Christ Superstar. Superstar is sung by Marcus Lovett backed up by dancers, singers, and even three female backup singers in sequined gowns. It’s quite a production, it’s a great song… but there is just something weird about having this right after the ethereal Pie Jesu. It’s probably just my Catholic upbringing coming out… this non-traditional religious stuff always strikes me as a tad bizarre. 15. Gethsemane is sung by the phenomenonal Michael Ball. While Ball doesn’t look much like any image of Jesus that I’ve ever seen, he’s convincing as a man who is conflicted about his ultimate fate. More chills. Wow. 16. Moving into The Phantom of the Opera, we hear the Overture. There’s a Phantom-like guy up at the top of the stage pretending to play this on a giant organ and it’s fun for atmosphere, but as my husband points out, the Overture isn’t played on an organ, it’s played on a synthesizer. Oh well. It’s still fun. Too bad they couldn’t somehow rig up a chandelier to complete the effect. 17. The Phantom of the Opera. It’s hard not to like this song and the fact that Sarah Brightman is singing the part of Christine… well, it rocks. Antonio Banderas fills in the part of the Phantom here, though, and while I think he was fabulous as Che in Evita, I’m having a hard time with the notion of Phantom with an Hispanic accent. Possibly I’m just longing to hear Michael Crawford who is notably absent from the proceedings. 18. All I Ask of You pairs Sarah Brightman with Michael Ball. For all it is a bit over the top, this is probably one of the most romantic songs ever written, and Brightman and Ball’s voices are awesome. The only possible drawback is that they seem an unlikely couple, so it’s a bit hard to believe in them as the secretly in love Raoul and Christine of the musical. 19. The Music of the Night. This is a great song, normally sung by a man (in the musical it’s the Phantom’s big solo piece). For some reason Sarah Brightman sings it here. She sings beautifully, of course, so I can’t complain, but I would have preferred to hear Michael Crawford or Michael Ball. 20. Moving into Whistle Down the Wind, the first song is Tire Tracks and Broken Hearts. At first I thought I was hallucinating, but no, that really is Bonnie Tyler with a motorcycle, three backup singers, and a backup dancers. Weird. I do like this energetic song, although I can already tell it won’t ever be my favorite. It did make me wonder what on earth the musical Whistle Down the Wind might have for a plot. 23. Car Chase on Sunset Boulevard – The orchestra plays what sounds like it might be the overture or prelude to the musical Sunset Boulevard. 24. Once Upon a Time – Glenn Close and Marcus Lovett. Lovett merely has a speaking role here, as he and Close set the stage a bit for the next two songs. Close won a Tony Award for her role in Sunset Boulevardas Norma Desmond, a movie actress who is something of a has-been. Close chose to do this in full costume, bringing something of the musical stage play to the Celebration. 25. With One Look – Glenn Close – This is a good song, and Close makes up in believability of character where she lacks a bit in voice. I was surprised to see that Close actually can sing competently; it is just when you put her on a stage with Michael Ball, Elaine Paige, etc… there isn’t a comparison. 26. As If We Never Said Goodbye – Glenn Close – excellent performance. 27. 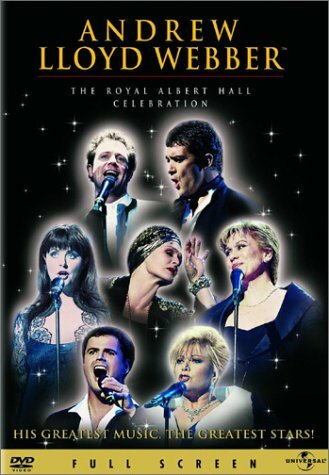 Love Changes Everything – Michael Ball accompanied by the full cast. This song is from Aspects of Love, one of Lloyd Webber’s smaller and less well-known productions. It happens to be my favorite of his shows, though, and this my favorite song from that show. Ball sounds fantastic and it is fun to see everyone come out and join in; this is possibly my favorite moment on the entire DVD. It’s very celebratory! 28. I have never understood people’s enjoyment of the musical Cats. Unlike most of Lloyd Webber’s work, I hate almost all of it. The one exception is Memory, of course, and Elaine PAIGE comes out and sings it beautifully. Andrew Lloyd Webber comes out after this song to say a few words about musical theater and to introduce the next singer, Kiri Te Kanawa. 29. Kiri Te Kanawa comes out to sing a new Andrew Lloyd Webber song, not apparently attached to a show. The Heart Is Slow to Learn is the title. I don’t think this is likely to be a favorite show-stopper in the future, as it is sung in an operatic soprano that makes it a bit hard to sing along. That being said, I enjoyed it. At this point the show stops for the cast to sing Happy Birthday to Andrew Lloyd Webber. 30. Lottie Mayor comes out and reprises Whistle Down the Wind, with Sir Andrew Lloyd Webber himself accompanying on the piano. I might have preferred to hear a different song just for variety’s sake, but the song is a good one and it did offer a sense of closure to the concert. It is interesting to hear two different singers perform this in one evening as well. Mayor’s interpretation is far gentler than Tina Arena’s as well. 31. The End Titles then roll while the Orchestra plays what I believe is The Jellicle Ball from Cats.